Original unique new year cards, christmas cards 2011, company corporate new year cards, custom made cartoon and funny cards. 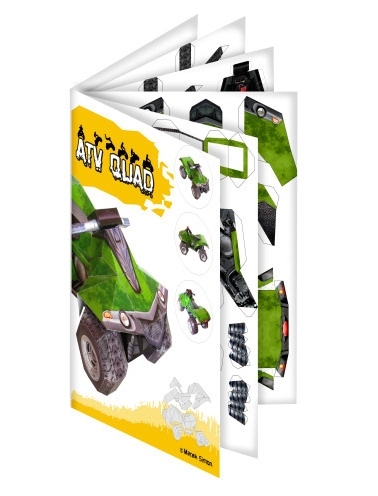 Original unique new year cards 2015, promotional paper models atv quad as a corporate gift. If you do your bussiness in the branch of motorism and if you want to catch attention of your bussiness partners, clients or simply want an uncommond stuff to sell, we have something for you. You will differ from your competitors, amuse your bussiness partners and customers and what is more, you will get an effective promotion tool. 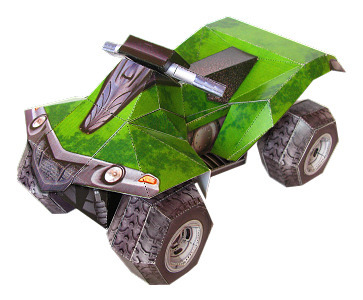 We offer you a unique paper model of quadrycycle with possibility to print your logo and contact details. 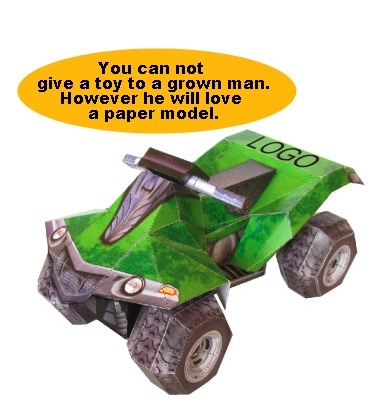 You can order the paper model also without printing. You can put your own sticker or stamp it on your own. The photos of the model are in the photogallery section. The development took a couple of months with the main focus on enjoyable and easy assembling. The system of joins is designed to be as intuitive and natural as possible and to look good even when it is cut and assembled less precisely. Thanks to the ingenious, but simple system of joins and reinforcements the model is pleasantly robust. The model is distributed in a form of brochure of classic A4 format. You will find the detailed pricelist below. In case you want to save money on logo printing, you can easily stamp it with your existing stamp. Or you can use your own stickers. It is easy to store and distribute. 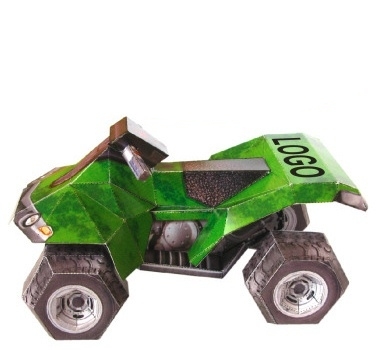 You can not give a plastic toy to an adult, but with paper model you can. When somebody dedicates so much time to build the model, he or she will keep it for years. He or she will usually display it on at some well visible place and will be glad to show off. Do you know any other promotional gift which would also work this way? When assembled it attracts attention. Decoposed it makes people curious. They will be eager to try assembling. The A4 format is suitable for sending in an envelope. For example together with other documents. Contains graphical instructions in a form o pictogrammes. Thus it is suitable even for foreign partners and customers without need to translate anything. In case you will be selling this model, you will surely appreciate, that there is not any contact on us. Thus the customer can not order the quad from us and also never learns the original price. Do you have any special requests or demands ? Please see the FAQ section. If it wont help, we would be glad to answer your questions on originalni-pf@email.cz or +420 605 53 58 59. We prefer communication via email. The minimum order is 100 pcs. Prices are without freight costs. The goods can be also picked up personally at our office in Vysoké Mýto 566 01 Czech Republic. Send the order on originalni-pf@email.cz. Write the number of ordered pieces, your delivery address, invoicing address and tell us whether you want to print a logo on the model. If so, please attach your logo in electronic form and/or your contacts or text. Graphics ideally in cdr, ai, eps files. It is possible to use also jpg, bmp etc. files in case they will be of a sufficient quality. Before printing we will send you a preview for your approval and price calculation.